Scalene are a group of three pairs of muscles in the lateral neck: scalenus anterior, scalenus medius and scalenus posterior. Sometimes a fourth muscle, the scalenus minimus is present behind the lower portion of the scalenus anterior. The brachial plexus and subclavian artery pass between the anterior and middle scalenes, while the subclavian vein and phrenic nerve pass anteriorly to the anterior scalene as the muscle crosses over the first rib. Ascending cervical artery, a branch of the Thyro-cervical trunk for all the 3 divisions of the Scalenus muscle. 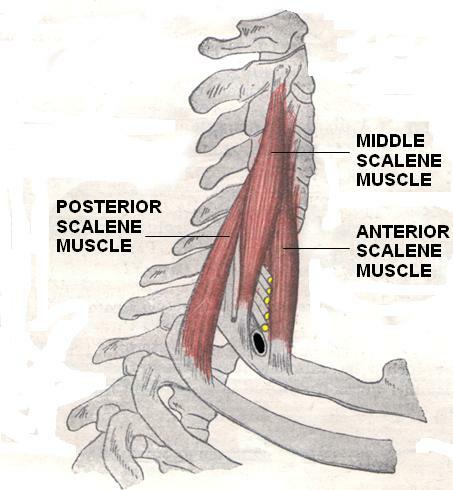 The action of the anterior and middle scalene muscles is to elevate the first rib, they also flexes and laterally bends the neck to same side.The action of the posterior scalene is to elevate the second rib and tilt the neck to the same side.They also act as accessory muscles of inspiration, along with the sternocleidomastoid. Scalene myofascial pain syndrome is a regional pain syndrome wherein pain originates over the neck area and radiates down to the arm. This condition may present as primary or secondary to underlying cervical pathology. 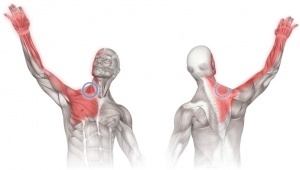 Trigger point activity in the Scalene muscle group plays a significant role in many upper body pain complaints. A therapist must know this muscle group and its trigger points very well if they are to offer effective solutions to their client’s chest pain, upper back pain, shoulder pain, radiating arm pain or thoracic outlet syndrome, wrist pain, and hand pain complaints. Wearing a tight collar or tie. Individual Position: The individual is lying supine with their head elevated and rotated to the contralateral side to be assessed; with their hands raised above their head. Practitioner Position: The practitioner is standing at the head of the table with the fingers of their hand on the forehead of the individual. Description of Muscle Test: The individual is requested to flex their head to their chest against the practitioner’s mild resistance. The first thing you need to do to get rid of your scalene trigger points is to eliminate the underlying causes. Gently place the tips of the fingers on your right hand on the left side of your neck. Hold with slight pressure on a spot on the side of the neck. 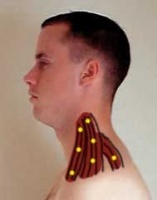 Repeat in a slightly different area of the neck and to both sides.Repeat 5 to 10 times on both sides of the neck. It may be helpful to apply a hot pack or heating pad across the neck for 10 to 15 minutes before performing this stretch. Between stretches, use proper diaphragmatic breathing, taking deep, slow, breaths, to relax the neck. Bring the opposite hand over your head so that your fingers make contact with the top of the ear. Gently pull the head and neck so that it tilts to the opposite side of the side you want to stretch, relaxing your neck muscles as you do so. Try to pull your ear down to your shoudler. Now, you will rotate your head, and the degree of rotation will determine which scalene is targeted. To target the anterior scalene, turn your face away from the pulling arm. To target the middle scalene, look straight up at the ceiling, or just slightly toward the pulling arm. Hold the stretch for around six to seven second. To strength scalene sit in a comfortable chair. Place the palm of your right hand on the right side of your head. This hand acts as a stabilizer in the exercise. Begin to move your right ear toward your right shoulder while maintaining the resistance provided by your right hand. Repeat 8 to 12 times on each side. By strengthening the scalene muscle you will increase your ability to stabilize your cervical spine, which reduces the risk of a future injury. 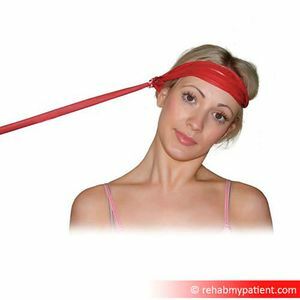 Another exercise to strength scalene: sit or stand up straight with a resistance band looped around your head. Hold the ends of the band firmly to one side ensuring there is some tension in the band. Pull the band away from your head, resisting the movement by keeping your head in a neutral position. Hold this position, relax and repeat. ↑ Abd Jalil N, Awang MS, Omar M. Scalene myofascial pain syndrome mimicking cervical disc prolapse: a report of two cases. Malays J Med Sci 2010;17(1):60-6.